stylos: "Begat: The King James Bible & the English Language"
"Begat: The King James Bible & the English Language"
Another story of interest as we approach the 400th anniversary of the AV: The NPR program "Talk of the Nation" had as its subject last Wednesday (December 22) discussion of David Crystal's book Begat: The King James Bible & the English Language (Oxford University Press). 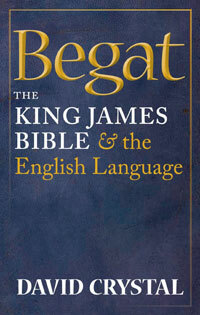 In this book, the author "sets out to prove that the King James Bible has contributed more to the English language than any other literary source." You can read a brief overview or listen to the entire c. 30 minute program here. You can also read an excerpt from the book here. I heard on BBC Radio 4 today that they're beginning a series of programmes celebrating the anniversary of the King James version. I couldn't but pray that the Word which will be read from the Scriptures on these programmes might be blessed by the Holy Spirit to some who hear it. Amen! It's wonderful to consider how the Lord gets his Word out to a dying world--even on the Beeb! It'd be great if a few of the zombies working behind the booth were awakened, too. 400yrs of the Holy Word of God in English--Praise Jesus!